Week 3 has been something of a disappointment. Most divers would have been delighted to see a manta ray, a trio of Eagle Rays swimming in tight formation (not unlike a Blue Angel fly-by during the Super Bowl), and a dolphin swim-by complete with calves whose flukes flap three times for each of their mom's. The water has been generally hazy, and when there is a reverse current (south to north) the turtles are wary. If the reverse current is coupled with an overcast sky, most turtles don't bother showing up, especially if that current is a strong one. These are the conditions that we've been getting lately. On one particular uneventful gloomy dive, we had a strong reverse current pulling at our tendons. Gloom hung all around, and we thought, "Only idiots would be diving in this stuff." Some interesting things did happen, though. A few days ago we sent email to George Balazs of the National Marine Fisheries Service to let him know that our venerable Grand Dame, Tutu (Hawaiian for grandmother) still hadn't shown up at the Turtle House. 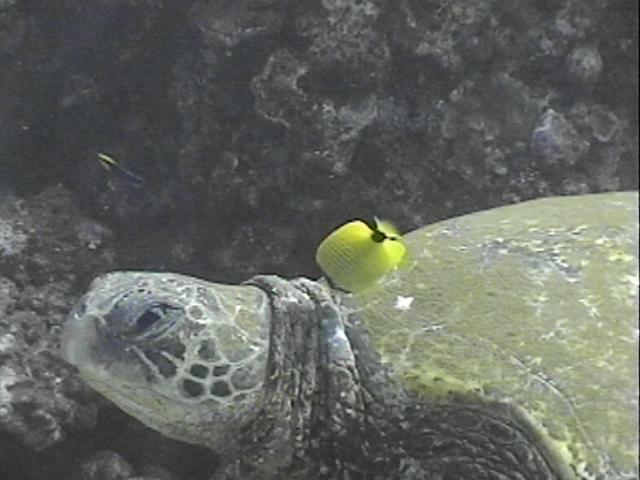 In 1994, when Tutu last nested, we first sighted her in Honokowai on the morning of August 25th. This year, we will make our last dive on August 26th. The wait thus begins for a large tagged female with a fascinating history, at least to us. We like to think that at time of writing, she is laying her last batch of eggs for 1996, and soon she will begin her return migration to her home foraging grounds right here at our dive site in Honokowai. U521 is a Maui girl and our thoughts and hearts are with her. We wish to thank George Balazs and the French Frigate Shoal people for informing us on Tutu's status and for her new paint job. 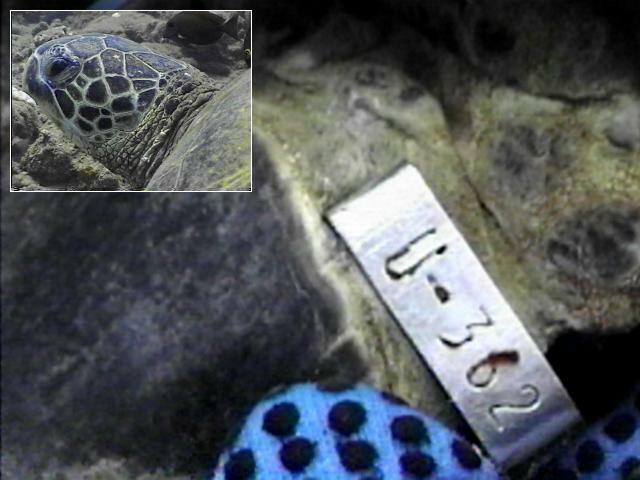 On July 16th, we read the tag of a large female turtle resting at the Honokowai turtle house. A tag on her left hind flipper read U362. As with almost every turtle at our dive site, U362 has tumors. We only observed her left side as we did not want to push our luck and frighten her away. She had a tumor in the posterior of her left eye, and a golf ball sized tumor under her left "armpit" (if indeed turtles can be said to have armpits). 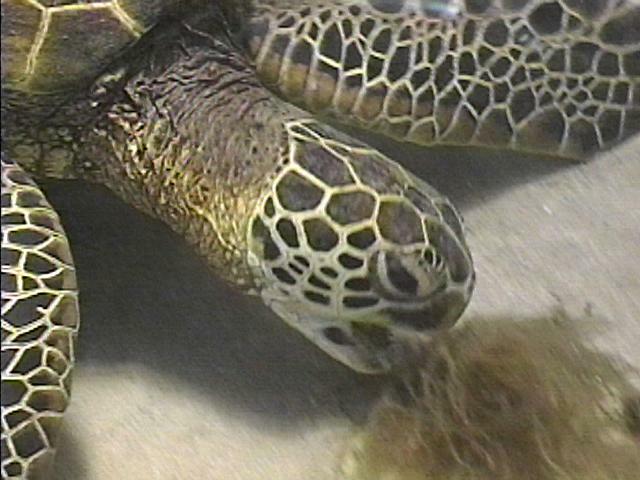 We hope to have more information on this turtle in the next few days when we get word from the National Marine Fisheries Service about her nesting record. Zeus is the largest turtle we have ever seen. Zeus is male and big. We are talking big as in how-does-he-manage-to-swim kind of big, his neck-bigger-than-his-head kind of big that makes him look like an aging wrestler. If Zeus were a human he'd play defence for the Green Bay Packers. Zeus was sighted for the first time this summer at exactly 9:00 am on July 17th. We assumed he was absent because he was doing his duty making baby turtles at the French Frigate Shoals as all good Hawaiian male turtles do. We have been expecting him to show up, since males typically leave the nesting area earlier than the females do. What we saw puzzled us. Zeus' shell looked ratty and covered with the red silt of West Maui, like he'd been here all along but only now condescended to show himself. Unfortunately volunteers at the French Frigate Shoals don't usually tag or identify males and so we will never know. Either way, our first sighting of him had us thinking. Now, Zeus is old. We figure he is as old as he is big. What we witnessed, however, was not so much the majestic return of our number one male, but an animal who looked weary, ratty, and had seen better days. He looked like he'd been on an all night binge... then again maybe he did just return from the French Frigate Shoals. He didn't look much different than most New York businessmen who have taken the red-eye to Tokyo. Both young turtles skimmed over the seaweed bed, looking as though their eyes were intent on just the right limu. To our untrained eyes, however, what they chose to munch down on looked exactly like all the other seaweed in the area. We couldn't tell just what it was that made some clumps more attractive than others. All we could do is follow along, the turtle doing its swoop and scoop effortlessly and us blowing our air trying to keep up. 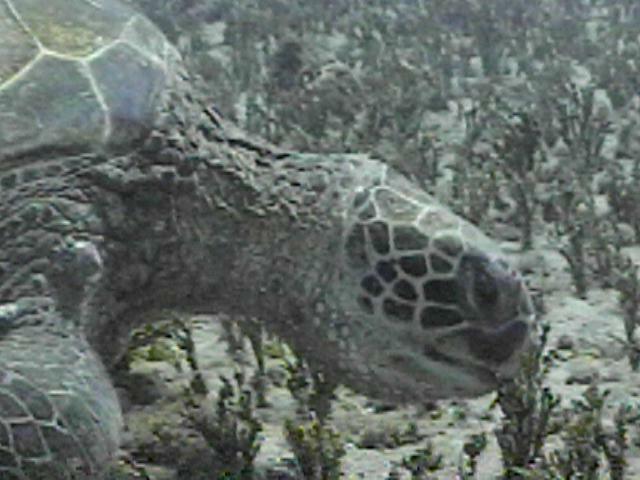 In contrast, we observed a larger turtle, Raphael, in about 55 feet of water eating Halimeda. (Halimeda is often called "Turtle Grass" locally, although it in no way resembles the seaweed that actually is turtle grass.) Like most of the adults we have observed foraging Halimeda, Raphael would lie on the bottom surrounded by the stuff. She would daintily crop only the very top portion of the plants, then crawl along the bottom a few feet and clip at another cluster. 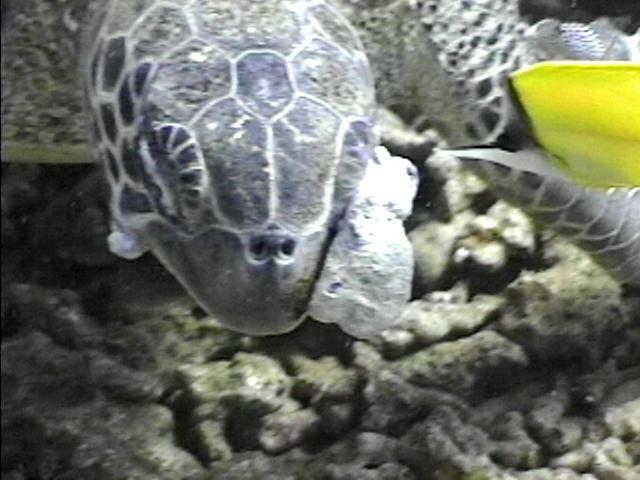 We observed Raphael eating back in 1992 in the same area. Her style hasn't changed. She prefers to eat in privacy because she will maneuver herself so her rump is in your face and her head is farthest away from you. This reticence reminds us of a card player shading his cards with hands and shoulders as you try to see what kind of hand he is holding. Most turtles have them. It is that simple. Of all the turtles sighted only Tamu, Gotcha, Aikane, and Zeus are free of them and the eyes of both Aikane and Zeus look suspect. To date 17 regulars have shown. 13 of the turtles observed last year have still to show up. 6 regulars (all having tumors) have been missing for over two years now. That makes 36 animals of which all but 4 have or have had tumors. Of the ones still missing but observed last year, Barney, 93-8D, 93-11, 4 Spot, Ludwig, and Howzit were so badly tumored we really don't expect them to show this summer. We've checked our records. The latest Howzit has ever showed up was July 19th. We are hoping he shows up making a splendid recovery much like Tiamat has made. Otherwise it is best for all three of us that he doesn't show. We loved Howzit. No. That would be irresponsible and little turtles can choke on ribbons no matter the colour. The wait for Howzit continues.